I am so excited and thrilled to share these incredible news with you! After 4 years of meetings, phone calls and exhibitions with experts in Parkinson Disease I finally got my first official grant to implement my program with Parkinson patients. The program will take place at the Capistrant Parkinson Center in Bethesda Hospital St Paul, Minnesota. I modified my program and designed specific exercises aimed to improve in the following areas: Motor skills, balance, hand eye coordination, posture, stamina, flexibility and meditation. My program is based in strength training combined with motor skills leading to a phenomenal physical workout and numerous health benefits. I can’t wait to get started with patients in Parkinson and show how this program can be extremely beneficial. I wanted to share part of the original grant so you can see why i am so excited! Increase variety of exercise components as part of current exercise group offerings, as documented in class description. Improve movements and attitudes, as observed by staff and reported on evaluations through the implementation of components of the Super Body, Super Brain exercise program. 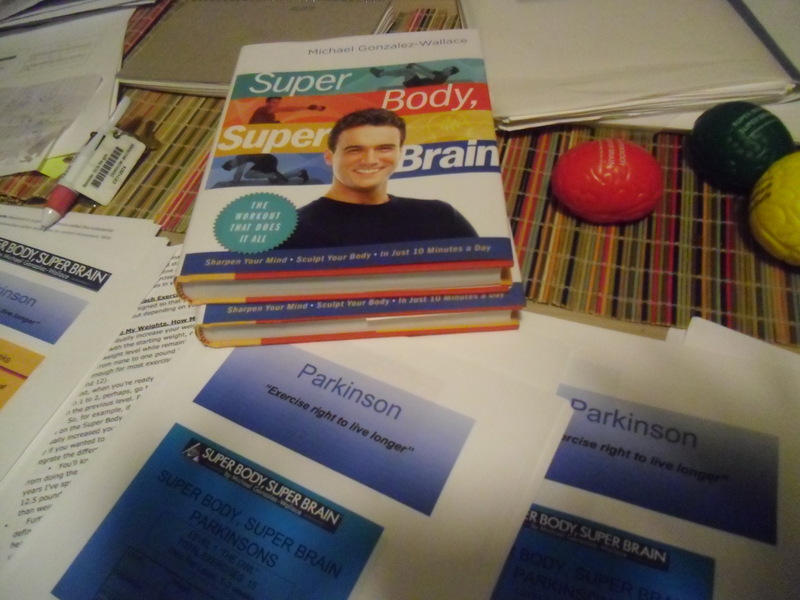 Program development: collaborative work with program creator to modify the Super Body, Super Brain progressive exercise program for the Parkinon’s/movement disorder population at various levels of physical capabilities. Staff training: Michael Gonzalez-Wallace will provide education to Physical Therapy staff for integration of the concepts of Super Body, Super Brain Parkinson as part of skilled therapy intervention. In addition, those Physical Therapy staff will train other staff (e.g. Physical Therapy Assistants, Recreation Therapists) for the purposes of group exercise facilitation using the Super Body, Super Brain Parkinson program. Who will carry out activities? Existing staff will participate in program development, training, coordination of class registrations and arrange scheduling. Amy Kieffer, Rehab Services Manager, will participate in program development and will supervise staff training and instruction of the class offerings. She will periodically attend/observe classes (as a volunteer) and assure the safety of the participants. Our recreation therapists will facilitate exercise classes. These staff have been trained in general exercise parameters and will receive specific training in regards to the Super Body, Super Brain Exercise program. Super Cuerpo, Super Cerebro en Minnesota! | " SUPER CUERPO, SUPER CEREBRO " El programa que mejora el cuerpo y el cerebro.